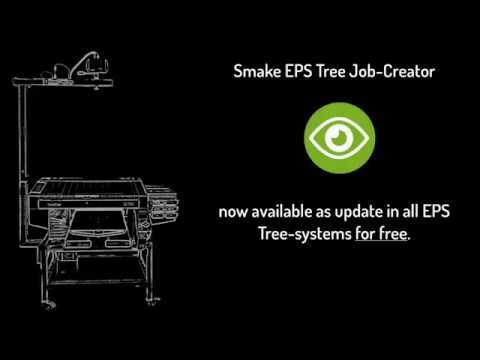 Smake® EPS Tree – positioning is brilliantly simple! A small but essential component in the production is the accurate, precise and fast logo positioning. With Smake® EPS Tree you have a product at hand which provides enormous savings of time and costs in your production. The patented Smake® EPS Tree is developed towards simplicity, speed, accuracy and ease of use – as ›KISS‹- procedure (keep it stupid and simple). The result is as ingenious as simple. For many years -in a blind ight- employees slowly and inconvenient tried to nd the right position of the textile on the printing plate. Through numerous corrections lots of working time is wasted and lots of expensive mis- takes are being produced. Smake® EPS Tree helps you positioning motifs on the textile by millimeter accuracy. With the beamer you can project motifs in original size and scale to the textile and make precise adjustments (moving and resizing) using a touchscreen interface. The new positional parameters are then automatically transferred which in turn can produce the favored result at a push of a button. Smake® EPS Tree also enables untrained staff to print textiles in the shortest period of time. You can combine the Smake® EPS Tree LED-beamer- system with the Smake® Value Production Work ow. Integrated in the Smake® VPW it gives you and your staff maximum security for a smooth and accurate overall process. Plug & Play – Promised! No sophisticated installation. Plug it in – beamer on – align once – ready! The all in one solution. Easy positioning tool for Brother GT3, GTX and Epson F2000 incl. EPS Job Creator.